The Netherlands, 30 September 2013 – At METS 2013 (Marine Equipment Trade Show, 19-21 November in Amsterdam RAI), DSM the producer of ultra high molecular weight polyethylene (UHMwPE), branded as Dyneema®, will show how the world of yacht racing will be reaching levels of extreme performance with the introduction of Dyneema® SK99, the strongest fiber ever made by DSM. Edwin Grootendorst, Global Segment Director at DSM Dyneema said, “Cutting edge performance in the world of racing yachts demands cutting edge products. Dyneema® SK99 is our latest innovation for running rigging. Naval architects employ super computers and theoretical fluid dynamic modeling software to ensure that racing boats can reach their maximum potential speed on all points of the wind. 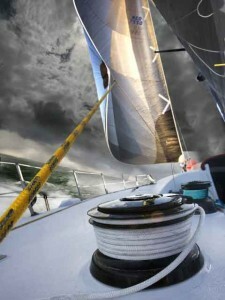 As any rigger, skipper or trimmer knows, transferring wind energy from the sails to the hull is the job of the rigging. Dyneema® SK99 delivers the highest tenacity available in a light weight, polymer fiber to date showing a 7% increase over SK90 and 20% over SK75 and SK78. This translates into thinner, lighter weight lines than traditional ropes, or lines with the same diameter but with significantly increased strength. The result is better performance from more compact rigging, which is lighter, takes up less space, lowers resistance and increases speed. The modulus is 10% higher than SK90 and 35% higher than SK75 and SK78. This improvement in modulus translates into lower stretch, better sail performance and thus faster possible boat response. Running rigging made with Dyneema® is the product of choice on boats where it matters. Ropes with Dyneema® are used on boats that range from the fastest, ultimate performance boats and round the world endurance racers, to recreational yachts. It has proven to deliver results and retain its properties over an extended lifetime and is not affected by the tough environment that can be found around the oceans of our world. • New England Ropes Corp.